Image Size 14.75 x 10.25 in. 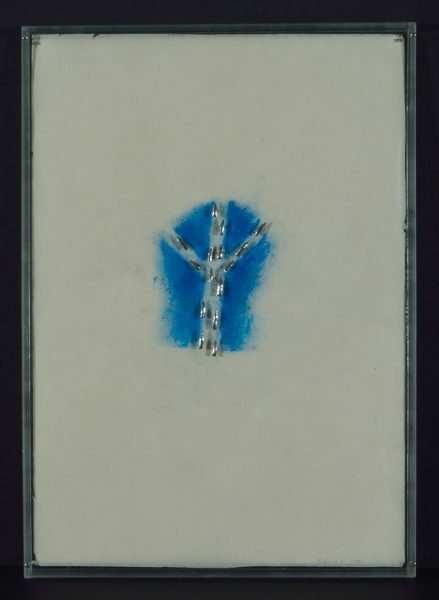 Zelenak has exhibited nationally and internationally beginning with work at the Helen Coffey Gallery, Houston Texas in 1961. Works have been exhibited in major cities across Canada as well as Chicago, Washington D.C., New York City, Prague, Czech Republic and Lausanne Switzerland and more. Museum London hosted a 40 Year Survey of his work in 2015. He is represented by Michael Gibson Gallery in London, ON. Visit his website at www.edzelenak.com. Divining rods have historically been used to locate water. In my work they present as signs/symbols reflecting on the nature of water and its morphological extensions. The branching serves as vehicles for movement – a journey through a perceptual and symbolic space. My work explores the condition of the inner self, the dichotomies of life, by employing the familiar iconography of trees, arrows, circles, stairs, crosses, boats, etc. As the viewer reflects upon and is drawn into these works, one simultaneously experiences a “knowing” of the greater cosmos and the connection on a cellular level to our own internal cosmos. Who are we ? And, where did we come from?